There is no “Design with a capital D”. There are two ways of writing nouns in the English language: you capitalize proper nouns and you don’t capitalize common nouns. There is an unfortunate tendency, however, for people to think that you can elevate the importance and even the definition of any old common noun simply by capitalizing it. To me, this is the typographical equivalent of using “unnecessary” quotation marks to indicate emphasis. There are some words, of course, that legitimately have this quality, for example God with a capital G is different from god with a lowercase g. Brand names often co-opt common nouns, too, and create new proper nouns: There is a difference between “facebook” and “Facebook“, for example. But we can’t just make new proper nouns up for no good reason. 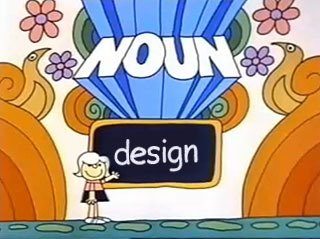 I am thinking specifically about the increasingly common use of the phrase “Design with a capital D”, or even the unqualified casual use of the capitalized “Design”, whenever a writer seeks to discuss the broader category of all design disciplines from the many smaller, more focused design fields which also use the one-word “design” to describe themselves (fashion design, interior design, graphic design). Even at a purely grammatical level, this is wrong: you simply cannot capitalize the word “design” because it is not a proper noun. There is no grammatical rule that says that you can use capitalization to indicate the importance or scope of a word — I can’t capitalize “Sports”, for example, and say it means the philosophy and values of sportsmanship as opposed to the lowly playing of games. If you found a company or wrote a book or named your dog “Design” you might have a case for the capital D. But the concept of “design” is already in the dictionary as a common noun, with a lowercase d.
But, more importantly, I don’t think we need to be making this kind of in-your-face overt distinction in the first place. The concept that design has several layers of meaning and scope is quite valid and useful, but the word itself is perfectly capable of encompassing both meanings. The English language, like many others, has some lovely ambiguities and idiosyncrasies in it. These gaps and imperfections may sometimes frustrate us, but they also make us think about words more, what they mean and where they come from. They force us to pay more attention to context, which we really ought to be doing anyway. When it comes to the various disciplines of design, I want to be frequently reminded that making a flowchart for a user interface and making a fabric pattern for a dress are closely related disciplines. I want to know that my own design discipline can learn from all of the others. I would rather have readers assume that the word “design” by default means all of the diverse design practices — unless the author or speaker indicates otherwise, implicitly or explicitly. I don’t think we’re quite there yet, though: most designers think of their own niche design discipline whenever they hear the word “design”. Still, capitalizing “design” is a crutch for both writers and readers, a short cut that excuses writers from explaining the interconnectedness of design, and excuses readers from embracing design more broadly. Instead, let’s just write and read more carefully, and let’s keep talking about design as a family of practices. And let’s also begin assuming the broader definition by default, unless told otherwise. Writers and readers will have to do a little extra thinking sometimes to figure out the meaning in any given context. But eventually the concept of design as a general way of thinking with many specific ways of practicing will take hold. 10 Responses to There is no “Design with a capital D”. Curious, you refer to your job title with a lower d (designer). I had alway thought that when using a title the first letter should be uppercase, as in; the Designer, Chris Fahey. Thoughts? @Andy: I capitalize job titles, especially in formal contexts (like on a business card or a subheading in a document), but I’ll always lowercase them when discussing job roles and whenever simply describing a job or role in a sentence (in an essay, for example). I think this is fairly traditional: you can say “the president walked out of the Oval Office”, but you call his job “President of the United States”. It’s the same with Doctor and doctor, for example: you don’t say “I need to go see a Doctor” or I am a Doctor”. Here’s a thorough guide to capitalizing job titles. I think those of us working in high-tech find a special need to highlight our titles with capitalization. I used to be a capitalized Information Architect, for example, probably in no small part because (a) we often abbreviate it as two caps )”IA”, and (b) ten years ago those words were so often seen next to each other in titles of books, conferences, and web sites. But really it’s no different than being a cashier or a cook, and you’d hardly ever capitalize those. Traditionally in poems, capitalizing a common noun (usually an attribute of mind like ‘reason’) meant asserting or at least suggesting an entity with a soul, with sentience. I can be more specific: capitalizing invoked a genius, in the old sense of the word. Geniuses really did use to be gods that were attached to specific nouns, common or proper. So if someone writes ‘Design’, habit (or perhaps I should use the Proustian ‘Habit’) impels me to imagine that the person alludes to the god of design! So I agree with you. One shouldn’t capitalize that word except on those days when he feels more like a crazed prophet than a designer. @Tom: Right on. It definitely deifies design when someone calls it “Design”. All of these are excellent reasons to suppress the “Design” usage! @Christopher – yes you’re right, all German nouns are capitalised. (I tell people when the unnecessarily capitalise words that we’re not writing in German!). Philosophy tutors despair at translators not understanding this and making words seem far more deified than was originally meant. @Jon That’s a great article, and from 1982 no less! But I don’t think Cross, or even Archer, would in the end beg to differ with me. Note that Nigel Cross quotes Bruce Archer’s desire for a “Design with a capital D” but then proceeds to use the word “design”, properly lowercased, for the rest of the document, including in the article’s abstract. He even sticks with the lowercase d design usage in his book of the same name, Designerly Ways of Knowing”. Either he is afraid to practice what he’s preaching, or, far more likely, what they’re preaching isn’t intended to be taken literally. I think both of them were rather using the expression “Design with a capital D” metaphorically, to illustrate the qualitatively different scope of the holistic study of “design” they were talking about (again, something I completely agree with and frankly don’t even think is a particularly difficult concept). I doubt they were actually suggesting that we break with academic and philosophical precedent (what other area of study and inquiry get capitalized in English? ), much less break the basic rules of grammar. Did this article make it sound like I think there is no such thing as an overarching theory of design that contains all design disciplines? Because that’s not how I feel. On the contrary, I think this idea is so basic, so easy to grok, accept, and then proceed to converse within, that almost everyone I know takes it for granted. That’s why I dispute the need to capitalize the word. This is similar to why I don’t capitalize “web” any more — if I mean to discuss a spider web or anything else besides the World Wide Web, it is incumbent upon me to make that clear. Similarly, when someone uses the word “design” and does not mean the “whole design universe”, it is their responsibility to make it clear that they mean, say, industrial design or interior design. Most of the time they can do this through context (an article in a graphic design journal can probably use “design” as a shorthand for graphic design). Insisting that we use a different capitalization or a different word for the holistic concept of design puts an unfair burden on writers. What’s more, it turns what should be an easy and widely-accepted concept into something unnecessarily obtuse and grandiose, undermining the very objective of tying the design disciplines together. The word “art” has had a similar problem. Painting, dance, theater, poetry are all “art” forms. We all get that. But to most people, at first blush, the word “art” means visual arts (largely, I think, due to elementary school “art” classes). But it’s rhetorically easy for even a mediocre writer or speaker to reconcile that problem by simply communicating well. The “Art with a capital A” trope is something that you’ll never find in any serious writing of art criticism or theory. It’s only found in bad college essays, which, IMHO, is where “Design with a capital D” should be buried as well. design in it’s most basic sense is just the creative solution to a problem and as you said can encompass a wide field of practices. perhaps the use of a capital is the need by some in inflating the importance of their work. I’ll go with Tom and invoke capitals only when i feel like a crazed prophet.